Ventev is a company that specializes in charging and protective solutions for your mobile devices. They have a wide product line covering wall charging, car charging, phone-mounting, and screen protection. Here, we are looking at the Ventev Wireless Chargestand, a sleek wireless charging stand that powers any wirelessly chargeable device. It is compatible with Qi, Apple Wireless Fast Charge, and Samsung Wireless Fast Charge. The Wireless Chargestand comes in at $59.99, in gray and white color options. Let’s take a look at the Wireless Chargestand and see how it handles our Samsung Galaxy S9. The Wireless Chargestand consists of a base, frame, power cord and wireless charging puck. The puck is plugged into a power source via its 6-foot long power cord, driving the wireless charging of devices. You can use the puck with the stand, where it can be adjusted at various heights to allow you to position the puck where it would be closest to the center of your device. Should you want to take up less space while you charge your phone, you can use the wireless puck without the stand and lay it flat on any surface. The frame can also be flipped, giving you two viewing angle options for leaning your phone. 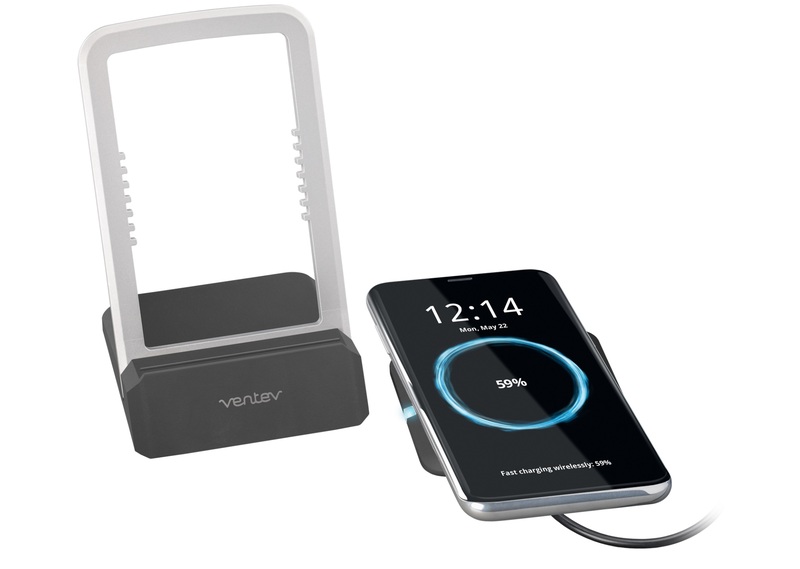 Ventev’s Wireless Chargestand pushes wireless charging quite far with its incorporation of two wireless charging technologies, Qi and Fast Wireless Charging. The power cord is a generous six feet long and is UL certified, meaning it has been rigorously tested for product safety. You have an LED on the puck that helps indicate charging statuses or issues with power. Thanks to the many height options available to you, you can have the puck arranged wherever you need it to be to charge devices of practically any size. You can even set the puck to its lowest height settings should you want to sit your phone sideways in landscape mode. The 15W wireless output from the Wireless Chargestand encourages you to do just that. This amount of output allows the stand to power your device beyond the drain from more rigorous ongoing tasks, like gaming or video streaming. Surely, you are not getting an optimal charge rate for your device while it runs battery-guzzling tasks. Even still, having a device resting on a stand like this somewhat implies that you plan to leave the phone powered on, while it charges. After all, one of the main conveniences of wireless charging is being able to both plop your device or grab it from the stand at a moment’s notice. So we decided to vet how much time was needed to somewhat-fully charge a Samsung Galaxy S9 with the Wireless Chargestand while the device remained on. We let the battery drain down to 8%, closed all apps, and plopped the S9 on the Wireless Chargestand. The S9 immediately recognized that Fast Wireless Charging was in play and gave an estimate of roughly 2 hours and 53 mins to reach a full charge. After one hour, the phone was at 43% charge. An hour later, the phone reached 70% charge. At the 3rd hour mark, the phone hit 99%, with 3 minutes remaining before hitting a full charge. Then I had Bleach Brave Souls for Android playing on auto while wirelessly charging the Samsung Galaxy S9 it was playing on. Even with the game actively running and the screen brightness at about 70%, the Wireless Chargestand continued to charge the battery past the rate it was being drained at. This was not bad at all, considering all of the background tasks that run on our devices, including the constant retrieval and sending of data. If my phone was on its deathbed, and I needed more than a 35%-an-hour charge, I’d sooner plug the phone into a wall or at the very least shut the phone off before plopping it onto the stand. Either of those conditions would give you more or less 50% an hour, assuming your device has a healthy battery. However, wireless charging leans more on convenience; I was definitely not short on that with Ventev’s Wireless Chargestand. Whether you use the stand or lay your phone flat on the charging puck, the Ventev’s Wireless Chargestand is a sleek appliance that your desk or nightstand would be naked without. It has a pleasant and subtle appearance that feels right at home, wherever you station it. For $59.99, you get a nice countertop or desktop stand that gets the job done and keeps up with the latest devices out now. 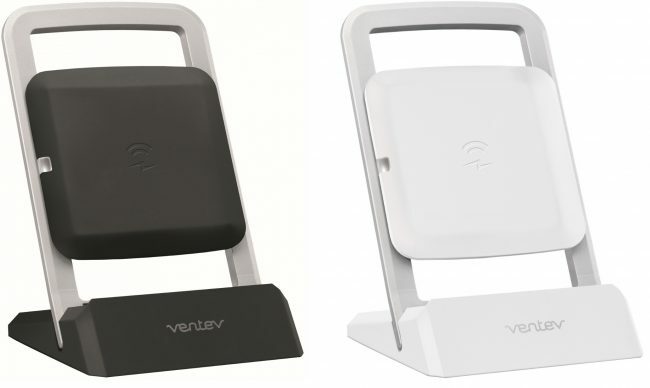 If you are looking into stationary wireless charging for your mobile devices, definitely give Ventev’s Wireless Chargestand a look on their website, here. † Ventev’s Wireless Chargestand provided by Ventev PR for review.